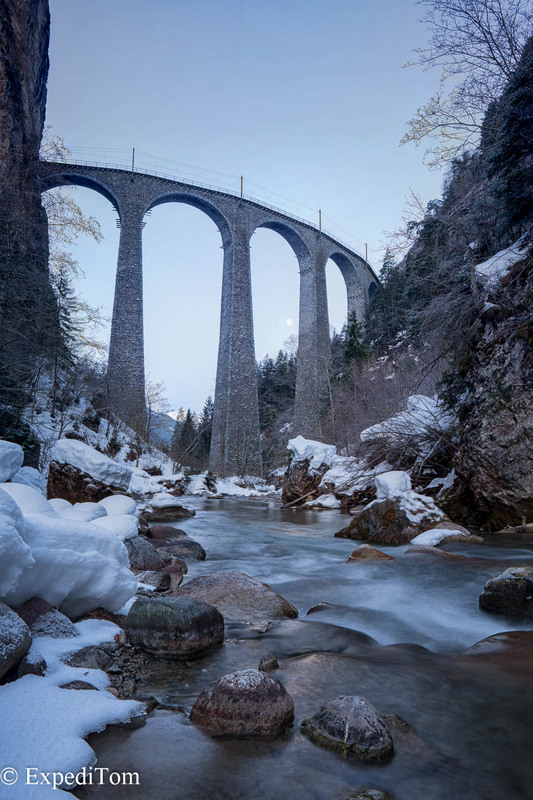 The Landwasser Viaduct in Switzerland – one of the most iconic UNESCO World Heritage sights in Switzerland. 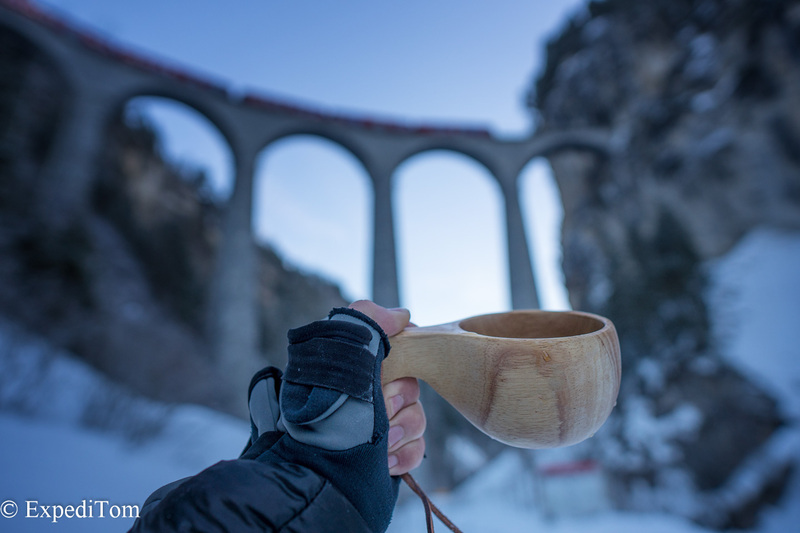 So I ventured on a Saturday to Filisur, which is very close to the Landwasser viaduct and where I slept in the Hotel Schöntal. Usually, I would have slept outdoors, but given I did not exactly know how cold it would be during the night I opted for the hotel. 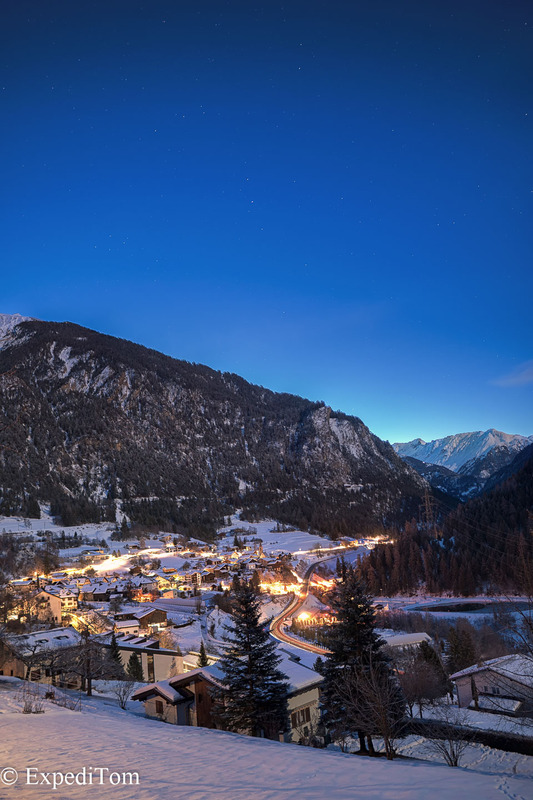 Leaving some gadgets in the hotel room, I left for the first southern look-out which is just a 20 minutes walk from the village. 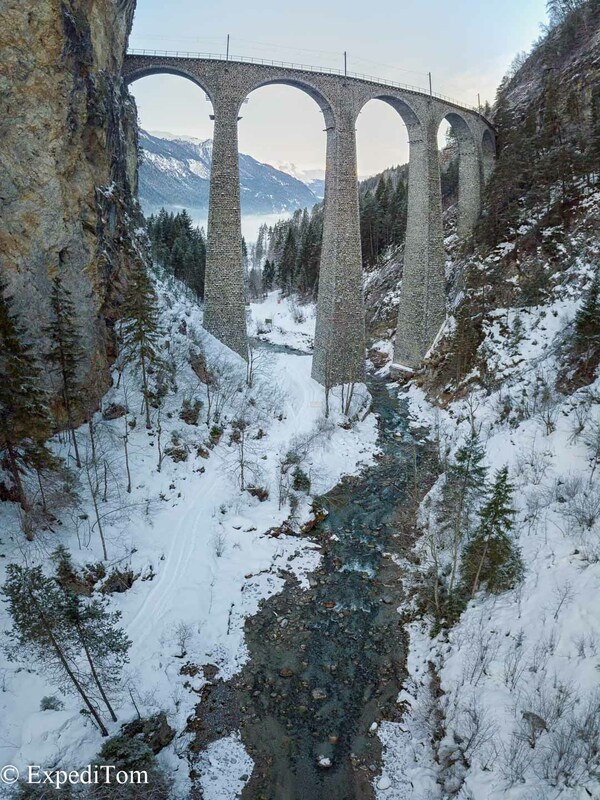 About every full hour 2 to 3 trains drive across the Landwasser Viaduct. I took some shots with the Sony A6500 and the telephoto Tamron lens 18-200mm f/3.5-5.6 and additionally I flew the Mavic Pro drone. Given that I had some more time left, I decided to go somewhere else. 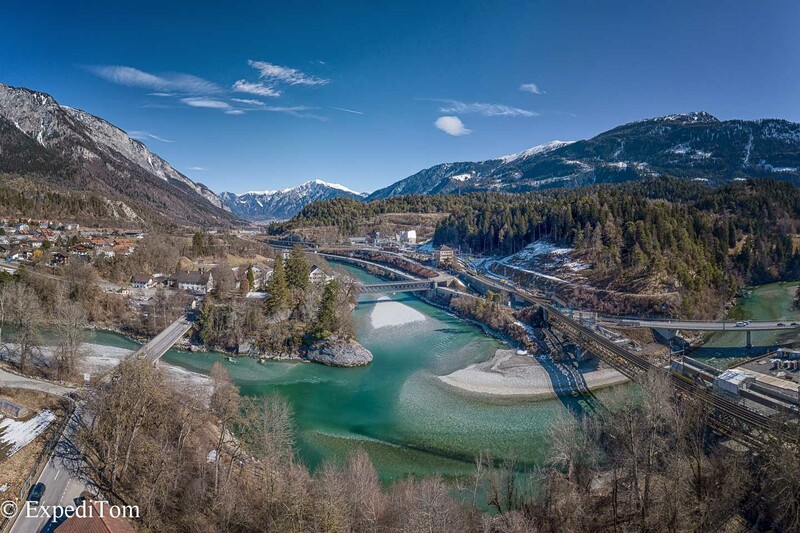 During the train ride to Filisur, I saw the confluence of the Hinter- and Vorderrhein in Reichenau-Tamins which looked amazing. Therefore, I went there. Down by the river, the views were less convincing, but the water resembled the one in Slovenia. Subsequently, I flew some rounds with the DJI Mavic Pro and returned home by train. Obviously my prepared composition did not work due to no stars, but at least I could check the degrees where the milky way should stand to be visible for the next time. Remember to always have a plan B when going to photograph a sight where you have to travel some distance, which is usually always the case. Sometimes unforeseen things happen like the weather changes or you just slept in and missed your opportunity. The latter happened to me this time. Nevertheless, I enjoyed this trip and met some interesting people. 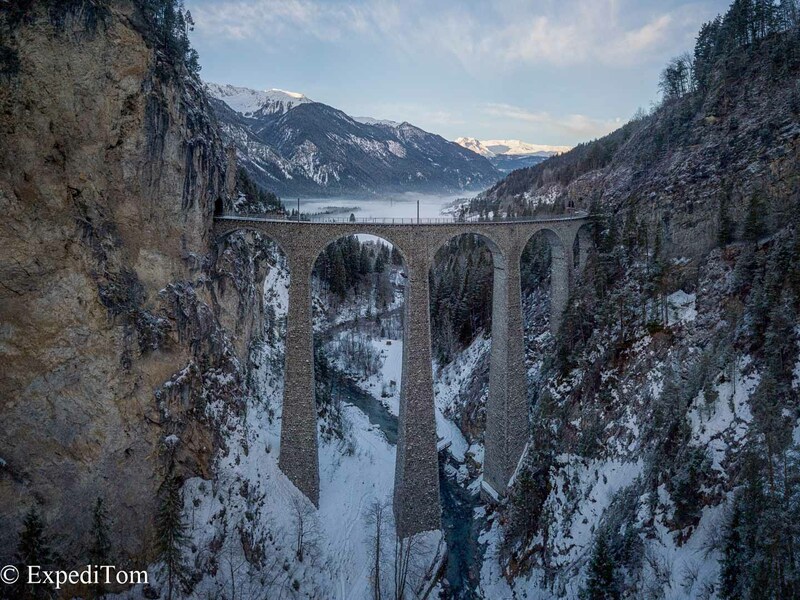 Drone composite of 3 exposures of the Landwasser Viaduct in Switzerland.Howver, all of them were too long in that the train was blurry. Bugger. 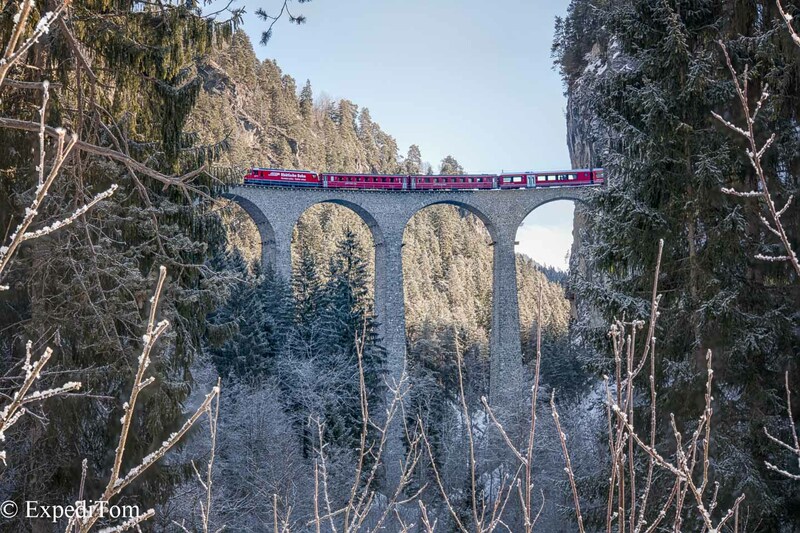 i am planning to visit in late Nov… may I know how I can find the route to bottom of the viaduct to be able to view the track like in your photos? Am planning to walk from Filisur station. You can either walk the designated hiking path from Filisur through the forest, but if there is lots of snow, you might consider taking the road. However, then you miss out the outlook from above. There’s a second one just on the opposite side, which is famous too. You’ll get there by following the hiking path from the bottom up. What time do the trains pass this bridge? Are there fixed allocations? 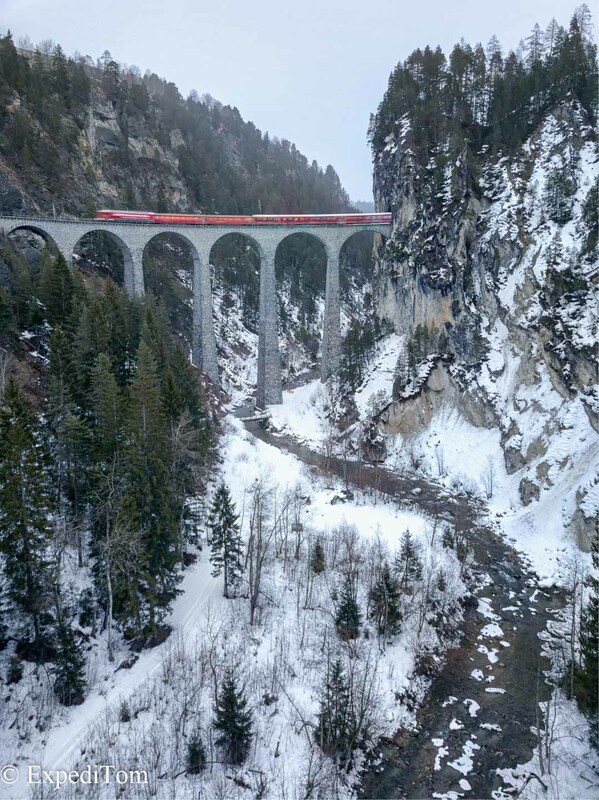 Check out the federal Swiss railway website (www.sbb.ch) and look the departure/arrival times between “Tiefencastel” and “Filisur” in both directions. This will indicate the times.